The major sections of the park include an Animal Park, an adventure park, an ornamental garden, the four seasons temperate house, a spices and beverages garden, a cactus garden, a tropical fruit garden and a couple of dams and lakes along with a cultural village and chalets. Most visitors to the park aim to spend more than day here so that they can explore its many attractions that are spread out over a large area and crisscrossed by a network of leafy trails. Accommodations are available at the park’s chalets which are modeled on traditional Malaysian village homestays and have a rather rustic feel. These chalets are located in the Kampung Idaman section of the park and the stays at the chalets are very well priced. The expansive National Botanical Garden Shah Alam can be explored on foot, on bicycle or then onboard the free shuttle bus service which traverses the entire length of the park and goes all the way up to the scenic Sungai Baru Dam. However if you choose to use the shuttle bus you are somewhat limited in your explorations of the park, as the bus offer pickups and drop offs at only scheduled bus stops within the park. Bicycles are available for hire at the entrance of the park and are very reasonably priced at RM5 for the first hour and then RM1 for every subsequent hour. The Skytrex Adventure Park offers a variety of forest based adventures that include various eco-recreational activities like walking on aerial ropeways, climbing and swinging from trees and even a fun paintball tourneys in the jungle. The Animal Park at the Shah Alam Botanical garden offers visitors a chance to observe and interact with various animals and birds. The park which stretches over 72 hectares claims to host ‘Nature’ s Beings in Gentle Custody’ and is home to creatures like deer, peacocks, porcupines, guinea fowls, parrots and ducks amongst others. The animal park is also equipped with picnic spots which are especially popular with visiting families. The Four Seasons Temperature House is one of the most popular attractions in the park for it offers residents of the tropics, the chance to experience the changing of the seasons, a phenomenon, that dwellers of temperate regions are well-versed with. The Four Seasons Temperature house resembles an air-conditioned warehouse and the temperatures within the house change in accordance with typical seasons so during the months of December and February the house registers winter temperatures, while during the months of March and May it features ‘spring’ temperatures while between the months of June and August and September and November it registers typical summer and fall temperatures respectively. The Spice and Beverage garden is a lush area that extends over 16 hectares and features many tropical plants and trees like tea shrubs, coffee plants, cocoa plants, black pepper vines, nutmeg trees, tamarind trees, lemongrass plants, lemon trees, chili plants, cinnamon trees and many more. 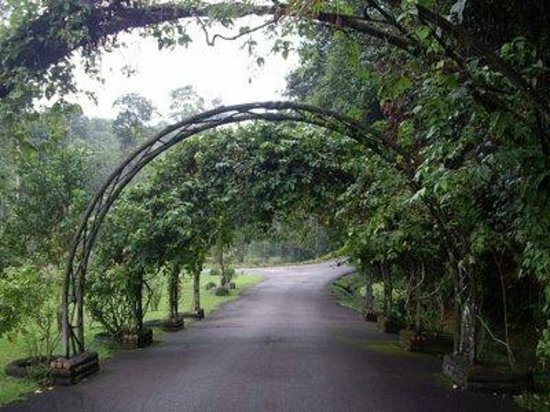 The Arboretum section of the park covers 40 hectares and features 45 species of native Malaysia trees and shrubs. The park offers recreational fishing at its Sungai Baru Dam and Sungai Air Kuning Dam areas. A fishing license is available at the park ticketing office for RM5. So if you have always wanted to try your hand at fishing, you can get going at the Shah Alam Botanical Park. Other attractions at the park include a Cactus Garden and Tropical Fruit Garden. The park also offers kayaking facilities at its Pool C area. The National Botanical Garden Shah Alam is open from 8am to 5pm from Tuesday to Sunday. The park is closed on Mondays though it remains open if a public holiday falls on a Monday. 8am – 5pm (Tuesday – Sunday) The park is closed every Monday except public and school holidays.